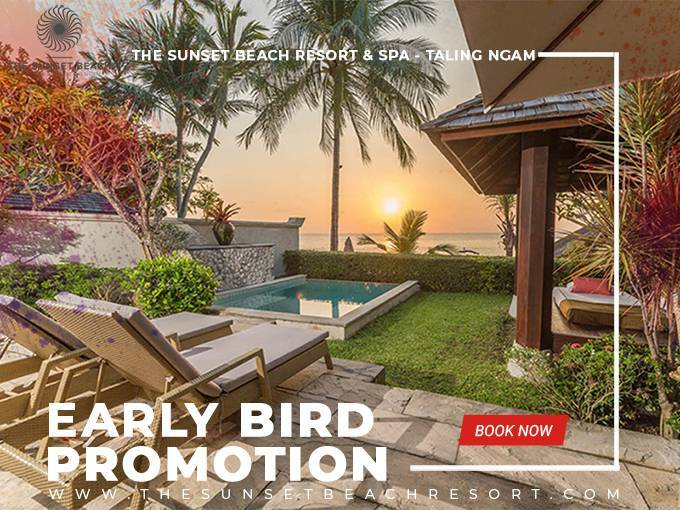 The Sunset Beach Resort & Spa is located in a secluded beach with spectacular sunsets! Far from the animated tourist areas of Chaweng and Lamai Beach, Taling Gnam remains the authentic Koh Samui. The ideal setting in which to relax and enjoy this unique location on a secluded beach with spectacular sunsets! Far from the animated tourist areas of Chaweng and Lamai Beach, Taling Gnam remains the authentic Koh Samui. A boutique hotel, recently remodelled by designer Philipp Pelletier (www.vieinterieur.ch), The Sunset Beach has undergone a complete transformation with a sleek, contemporary theme of artistic inspiration. Our Ananas Restaurant offers both traditional Thai cuisine and original international dishes of the highest quality, while our pool bar invites you to sample their creative snacks and signature cocktails in a relaxed, “chill” ambiance. Fully qualified spa therapists look forward to inviting you to unwind and be pampered in the harmonious atmosphere of the Lotus Spa with an extensive selection of treatments and Asian massages. Despite a wide range of activities at your disposal, the reception team will be only too happy to accommodate your special requests: be it a candlelight supper on the beach, excursions or car/motorbike rentals. Our welcoming staff will go out of their way to ensure that your stay with us will be a memorable one! Un lieu idéal pour se relaxer et se ressourcer grâce à sa situation tranquille et magnifique sur une plage isolée avec des couchers de soleil idyllique. Loin des zones touristiques animées de Chaweng et de Lamai Beach, Taling Ngam est l’authentique Koh Samui. Un boutique hôtel, récemment rénové et re-décorée par le designer Philippe Pelletier (www.vieinterieur.ch), sur un thème élégant et contemporain d’inspiration artistique. Notre restaurant l’Ananas propose à la fois une cuisine thaïlandaise traditionnelle et des plats internationaux originaux et inventifs de haute qualité, tandis que notre Pool Bar vous invite à savourer ses cocktails exclusifs dans une ambiance “Chill”. Un luxueux Spa vous propose de vous détendre dans une atmosphère harmonieuse en vous suggérant une vaste sélection de soins et de massages asiatiques et cela par des thérapeutes qualifiées. De nombreuses activités sont possibles et notre équipe de la réception sera ravie de répondre à vos demandes spéciales, que ce soit un diner aux chandelles sur la plage, des excursions, des locations de voitures ou autres. Notre personnel accueillant fera tout son possible pour que votre séjour soit mémorable! Der ideale Platz zum Ausspannen in dieser einzigartigen Lage an einem abgelegenen Strand mit spektakulären Sonnenuntergängen. Weit entfernt vom animierten Touristenrummel von Chaweng und Lamai Beach, Taling Gnam bleibt das authentische Koh Samui. Das Boutique Hotel vor kurzem vom Designer Philipp Pelletier www.vieinterieur.ch umgebaut, wurde einer kompletten Transformation unterzogen mit einem modernen klaren Thema von künstlerischer Inspiration. Unser Ananas Restaurant bietet beides : traditionnelle Thai Küche und original internationale Gerichte von bester Qualität, während Sie unsere Poolbar einläd, ihre kreativen Snacks zu probieren wie ihre Cockails in einer entspannten und » erfrischenden » Ambiente. Hoch qualifizierte Spa Therapeuten freuen sich, Sie zum Enstpannen einzuladen und zum Verwöhnen in einer harmonischen Atmosphäre im Lotus Spa mit einer grossen Auswahl von Behandlungen und Asiatischen Massagen. Trotz einer grossen Anzahl von Aktivitäten zu Ihrer Verfügung, wird das Empfangsteam nur zu froh sein, Ihre spezielles Wünsche zu erfülllen : sei es ein Abendessen bei Kerzenlicht am Strand, Ausflüge oder Vermietung von Autos oder Motorrädern. Unser Willkommensstaff wird alles daran setzen, dass Ihr Aufenthalt unvergesslich bleiben wird. Идеальное место для отдыха в уникальном месте и наслаждения захватывающшими закатами на уединенном пляже! Вдали от, оживленных туристами, районов Чавенг и Ламаи, Талинг Гнам сохраняет первобытность о. Самуи. Бутик отель, Sunset beach, недавно реконструированный дизайнером Филиппом Пеллетье, был полностью обновлен в элегантном и современном стиле. В нашем ресторане «Ananas» Вы можете найти, как традиционные блюда тайской кухни, так и привычные блюда интернациональной кухни, обладающие высочайшим качеством. В то же время, в нашем баре у бассейна, Вы можете попробовать оригинальные закуски и фирменные коктейли в непринужденной, расслабляющей атмосфере. Высоко квалифицированные специалисты спа салона приглашают Вас расслабиться и побаловать себя, в умиротворяющей атмосфере спа-центра «Lotus» с широким спектром процедур и разнообразными видами азиатского массажа. Несмотря на большой количество различных мероприятий, сотрудники стойки регистрации в полном Вашем распоряжении и будут только рады удовлетворить Ваши особые пожелания: будь то ужин при свечах на пляже, экскурсии или аренда автомобиля/мотоцикла. Наш гостеприимный персонал сделает все возможное, чтобы Ваше пребывание у нас было незабываемым! It is with a great pleasure we invite you to join us to celebrate our Thai New Year with celebration, activities and live station Songkran menu. Just the two of you, together in Paradise those wishing to celebrate a special anniversary or re-kindle an old passion. 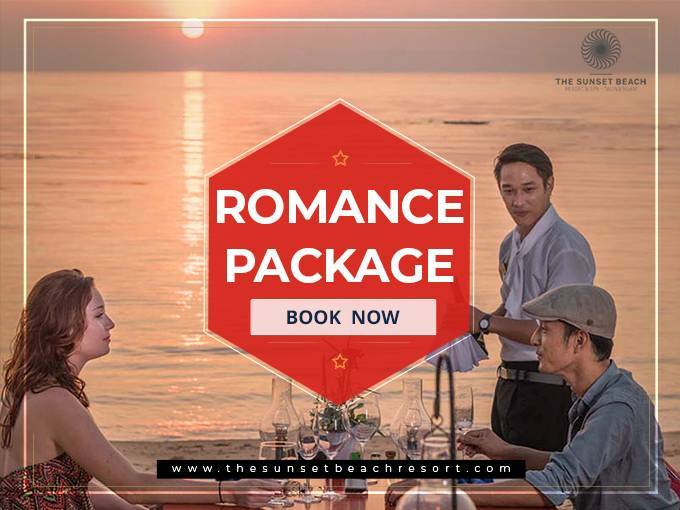 Stay in one of our romantic rooms or suites at The sunset beach resort & spa - Taling Ngam, and enjoy a fourth night for free.